Two people have been seriously hurt in a road accident in Fife. 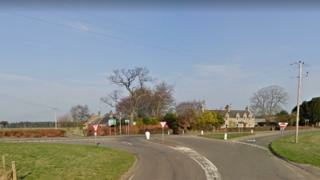 A man and woman both broke a leg in the crash on the A92 at its junction with the B9129 at Ladybank at around 05:00. Police said a white Volkswagen Up was in collision with a silver Vauxhall Corsa. The injured man and woman were the drivers. They were both taken to Ninewells Hospital in Dundee by ambulance. Officers have appealed for witnesses to come forward. A spokeswoman for the Scottish Fire and Rescue Service said the woman managed to escape from her car before it caught fire. Firefighters had to use cutting gear to free the man from his vehicle. The A9 was closed for several hours while investigations were carried out but has since reopened. Sgt Alastair Purvis said: "I'm keen to hear from anyone who may have witnessed this collision or the manner of driving of either vehicle beforehand."